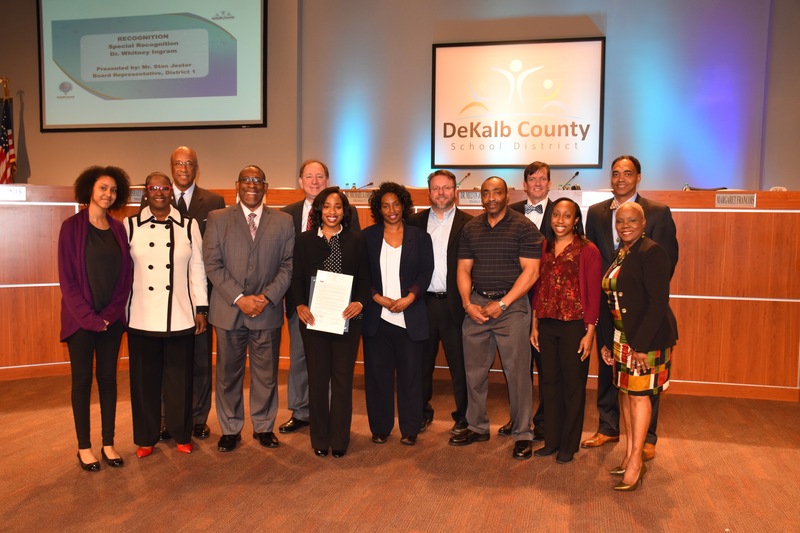 School board recognizes Dr. Whitney Ingram for being the 1st African American woman to receive a Ph.D in Physics from UGA. DeKalb Schools alum is the 1st African American woman to receive a Ph.D in Physics from the University of Georgia. Dr. Ingram’s focus during her doctoral program was nanotechnology, and she was a Fellowship Recipient at the Savannah River National Laboratory where she designed methods for quantitative chemical detection techniques and optimized nanostructures for the best detection techniques. Her accomplishments include a Science Graduate Research Fellowship with the Department of Energy and a fellowship with the Southern Regional Education Board. In 2015, she was one of 65 U.S. students selected to attend the annual Nobel Laureate Conference in Lindau, Germany where she met Nobel Laureates in physics, chemistry, physiology, peace and literature. She epitomizes the DeKalb County School District’s Mission to ensure student success, leading to higher education, work, and lifelong learning. We congratulate Dr. Ingram for her great academic accomplishment in having achieved one of the highest degrees attainable in the field of physics.